This dive site is filled with sponges, tall soft corals and a huge canyon. The canyon serves as a perfect entrance on to the wall and takes you right to where you can see the black coral growing. This 50' coral reef dive gets it's name from a 'Black Rock' sitting on the beach which was used by Cayman boat captains to locate the dive site before mooring buoys were installed in the late 90's. The mooring pin and the depth under the boat is only 20 ft, which provides a shallow ledge to start the dive from. The ledge runs East to West. There are also large coral fingers that span out from the reef slope all the way to the Cayman wall. Black Rock is about the color and fish life. As well as an excellent day dive this is one of our night dive sites. Located to the North of our dive shop. This is an wall dive site with an astounding drop off. This is a site where we regularly encounter sea turtles - hence the site name! Located to the South close to Frank Sound Barrier reef, This is a max 60' dive. The site site consists of mushroom coral formations and swim thru's This dive site is a favorite for photographers due to the shallower depth, coral and fish life. This dive site is a firm favorite of visitors and staff alike. An abundance of fish life, brain corals and sea fans. This dive is on a mini-wall with a ledge which leads to dozens of narrow passageways and an underwater maze filled with tarpon, squirrel fish, horse-eyed jacks, grunts and the occasional scorpionfish. Located just outside Colliers Channel. This 60' dive site features mini-wall with canyons and passageways - these resemble Swiss Cheese. Bermuda Chub, Tarpon, Snappers and Spotted Drums are regularly seen at this site. A shallow 65 foot maximum dive. This site is full of Nassau grouper and several species of jacks. At the reef crest there are numerous caves, tunnels and coral blocks. Large formations of Elkhorn coral stand in amongst sea fans and plumes. A deep dive site up to 100 ft, with many swim‐throughs in the fissures and caves, these will lead the diver into semi‐darkness and out into the beautiful blue wall. An abundant supply of brain coral, black coral fans and deep‐water gorgonian fans just add to this impressive site. A favourite among divers, Babylon is loaded with sea fans, large tube sponges, not to mention beautiful fish such as Parrot fish or Queen Angel fish. The wall starts around 40 feet, and drops into the Cayman Trench, ideal for the thrill seeking diver. Black Rock is a relatively shallow dive, with the ledge dropping off at 50ft. The swim through is home to many critters such as eel, grouper and even Caribbean Spiny Lobster. A labyrinth of tunnels, lined with lobster and eels, and schools of tarpon. They congregate there to feed on the rainstorm of silversides that often fill the passages. Also look out for the anchor of the 1872 wreck Methusalem at the end of the last tunnel. A 300 foot wide river of sand that slopes gradually to a depth of 120 feet, where the sand flow narrows. At this point, the slope becomes steeper, slanting on a 45 degree angle and continues to plunge more than 350 feet. The white sand slope looks like a snow ski run with mountains of coral formations boarding the sides. A small, flat topped coral reef loaded with more than a dozen separate schools of reef fish. Here divers can swim with and photograph groups of blue striped grunts, schoolmasters, sailor's choice, horse-eye jacks, Bermuda chubs and mahogany grunts. A medium depth dive site consisting of grove coral formations. The fish are so tame you almost have to push them away from your face mask. Residents of this reef include a big school of yellowtail snappers, sergeant majors and an extremely friendly angelfish. The Oro Verde, a 184 foot long steel cargo vessel was scuttled in 1980. In tact when sunk, it now lies on her starboard side in the sand next to a patch of reef, the wreck’s finer details have since given way to passing hurricanes which led the ship closer to the reef. A popular dive site for night dives, this shallow dive site approx 60-70 feet is home to lobster, shrimp, squid and more! Sunk off Seven Mile Beach on January 5 2011, the Kittiwake a 251 foot ex US Navy submarine rescue vessel is a must dive while in Cayman. Her 5 decks provide lots to explore. Sitting in 65 feet of water, with the shallowest point at just 15 feet, this is an ideal site for divers and snorkelers. A cluster of three small to medium depth coral reef systems that can be dived from shore. Coral heads are honeycombed with caves, tunnels and grottos that are often filled with schools of tiny silversides. A late afternoon dive has a cathedral like atmosphere as the sunlight streams through small openings in the high vaulted coral chambers. A 375 foot steel hulled freighter that sank during the great hurricane of 1932. Her dynamited remains are scattered over 7 acres of ocean bottom. A popular night dive, this wreck is loaded with life, including octopus, moray eels, red shrimp and parrot fish sleeping in cocoons. Located on the Southern tip of the West Wall, Devil's Grotto's rocky coral formations provide spectacular swim throughs and tunnels which house many tarpon and schools of baitfish. is a drop off with a giant coral archway. The top is at 105 feet, the bottom at 120. This is sheer wall approx 300 feet in length and etched by many winding channels and canyons. While there are many smaller tunnels, crevices and overhangs, the real thrill of this dive is the arch. 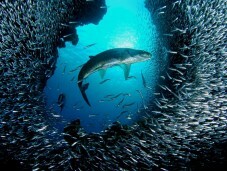 In addition to the swim through opportunities, a large school of tarpon hangs out in the canyons. Named as a result of the large orange elephant ear sponges. A giant coral head sits on the edge of the wall; two ravines form canyons on either side, trailing all the way back to 60'. Along both of these ravines are many different sized orange sponges, engulfed in gorgonians and sea fans. Bonnie's Arch consists of a high profile coral reef, with lots of coral ridges and sand canyons. The site gets its name from a natural coral bridge that forms a 50' archway. This site is frequented by a school of tarpon. Sunset Reef is a popular shore dive directly off Sunset House Resort. The reef is loaded with hard corals, sponges and seawhips. Farther out lies the LCM David Nicholson, a World War II steel‐hulled landing craft. New to this site is Amphitrite which is a 9 foot tall bronze mermaid created by Simon Morris and laid there by Sunset House in their effort to give the reef some damage relief. A unique coral pinnacle jutting straight up from a steeply sloping drop-off at a depth of 90 feet. There is a horizontal tunnel piercing the center and filled with a collection of black coral and colorful sponges. The entire pinnacle is covered with a colorful tapestry of gorgonian fans, orange sponges, red encrusting sponges and marine life. A large coral rampart that juts out from the face of the wall and helps form a gigantic basket sponge found at 105 feet. The sponge is in the coral valley, surrounded by black gorgonian fans and many hard coral formations. The unusual basket sponge is at least six and a half feet tall. A deep coral chasm leading to the wall. It is an awesome formation with towering coral heads, coral archways and narrow crevices-filled with magnificent sponges, gorgonian fans and black coral. This magical spot is also a regular gathering place for spotted eagle rays that cruise along the face of the wall. 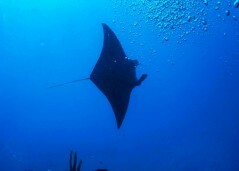 Divers frequently encounter groups or up to six rays on a single formation. More than 100 tarpon school together at this site in a narrow coral canyon near the edge of the dropoff. Divers can swim through the canyon almost touching the tarpon that are slowly cruising back and forth. Most of these silvery fish measure 3‐4 feet long, but there are some giants that reach five feet in length. An extraordinary coral formation perched on the edge of the drop-off. In fact, it is the only formation of its kind known to exist off Cayman. It is around 250 feet across at the base, rises to within 40 feet of the surface and is flat on the top. This formation is flanked by two coral canyons that spill over the wall and give it an awe-inspiring appearance. coral wall that almost defies description. The immense formation literally dwarfs the diver and vividly portrays the grandeur of the North Wall drop-offs. Two giant coral ramparts jut outward from the vertical wall. With a gaping chasm of clear blue water in between, it is about 150 feet from one rampart to the other, and the rim of the wall curves sharply inward forming a u-shaped indentation. The east end of the island is still relatively untouched by divers and offers pristine sites. With a variety of sites including caves and swim-throughs, coupled with superfluous marine life, the East End offers something special for the adventurous diver looking for something different. Daily boats departing from Morritt's Tortuga explore the 50+ dive sites around the East End, and we aim never to repeat a dive site during your stay! This is a wonderful wall dive, with the top of the wall at 55ft. It's loaded with black sponge outcroppings and a variety of marine life small and large. A premier wall dive with the top of the wall at 45ft. There is a large pinnacle just off the wall loaded with sea fans and large tube sponges. You'll want to dive this site more than once as you can't take in all the beauty on one dive. Large anemones and deep red sponges are abundant as well. It's not unusual to catch sight of a large shark, turtle or eagle ray! This is a comfortable shallow dive, with the mooring in 30ft of water and the ledge dropping off at 50-55ft. Along the ledge to the west is a swim through if you choose. There are crevices for lobster, grouper, eel and all sorts of critters. A shallow 65 ft maximum dive, this site is full of tarpon and jacks, often with eagle rays swimming in formation over the sand. At the reef crest there are numerous caves, tunnels and coral blocks. Large formations of elkhorn coral stand in amongst sea fans and plumes. This deep dive of up to 100 ft, can be affected by inclement weather but is worth the effort. With many swim-throughs in the fissures and caves, these will lead the diver into semi-darkness and out into the beautiful blue wall. An abundant supply of brain coral, black coral fans and deep-water gorgonian fans just add to this impressive site. Promoted by cruise ship TV commercials, dive and adventure magazines, Stingray City has become the world's most famous shallow dive. Here, divers can feed, pet and play with the friendly Southern Stingrays. Divers kneel on the sandy sea floor while tame stingrays swirl around in search of food. As you stroke the smooth undersides of the stingrays, you'll understand why this memorable dive has made Grand Cayman famous. Note: Stingray City dives depart from the Rum Point Dock which is a 25 minute drive from Morritt's Tortuga Club and Resort. The North Wall boasts spectacular drops-offs and fascinating marine life. 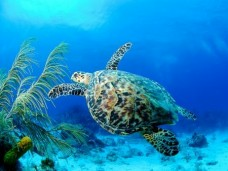 It is not uncommon to spot Eagle Rays, Tarpon and Sea Turtles. The exotic marine life clinging to the vertical sides of the wall make diving it a thrill to even the most experienced divers and photographers. North Wall dive boats depart from the Hyatt or Safehaven docks. White Stroke Canyon is a coral wall that almost defies description. The immense formation literally dwarfs the diver and vividly portrays the grandeur of the North Wall drop-offs. Two giant coral ramparts jut outward from the vertical wall. With a gaping chasm of clear blue water in between, it is about 150 feet from one rampart to the other, and the rim of the wall curves sharply inward forming a u-shaped indentation. Brinkley's Wall is a spectacular drop-off close to shore and quite vertical. The top of the wall begins at 35 feet and drops straight away. Underwater visibility in this area can exceed 160'. This site is loaded with tube, brown elephant ear and vase sponges. It's a great spot to find and photograph Cayman's famous blood red sponges. Inshore from the drop-off is a shallow strand of staghorn coral where yellow and gold seahorses are sometimes found. Eagle Ray Pass is a deep chasm leading to the wall. It's an awesome formation with towering coral heads, coral archways and narrow crevices- filled with magnificent sponges, gorgonian fans and black coral. This magical spot is also a regular gathering place for Spotted Eagle Rays that cruise along the face of the wall. Divers frequently encounter groups of two to six rays in a single formation. Tarpon Alley is where more than 100 giant Tarpon school together in a narrow coral canyon near the edge of the drop-off. Divers can swim through the canyon, almost touching the Tarpon that are slowly cruising back and forth. Most of these silvery fish measure three to four feet long, but there are some giants that reach five feet, and weigh approximately 150 pounds.